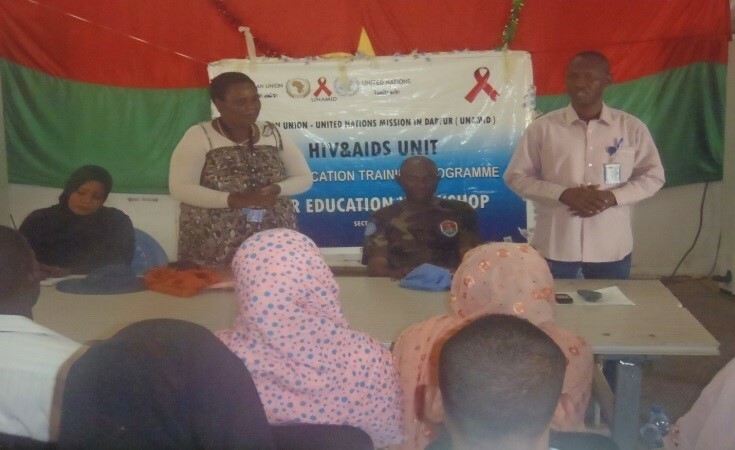 When I started volunteering in Darfur with the African Union-United Nations Hybrid Operation in Darfur (UNAMID) as an HIV/AIDS Trainer/Counselor, my responsibilities included carrying awareness training, counselling and testing. I worked with other UNAMID sections, other peacekeepers and internally displaced persons. The exposure and ownership that I've been given over the projects, as well as the time and responsibility that I've been given from professionals that I've worked with has been overwhelming. Darfur, Sudan: When I started volunteering in Darfur with the African Union-United Nations Hybrid Operation in Darfur (UNAMID) as an HIV/AIDS Trainer/Counselor, my responsibilities included carrying awareness training, counselling and testing. I worked with other UNAMID sections, other peacekeepers and internally displaced persons. The exposure and ownership that I've been given over the projects, as well as the time and responsibility that I've been given from professionals that I've worked with has been overwhelming. However, it was not an easy task for me to reach out to my target audience, due to a myriad of problems, chief among them: insecurity and the language barrier. Nonetheless, I managed to communicate through a national staff colleague I work with, who assisted in translating and introducing me to people, and provided guidance whenever we went on outreach visits.Local communities were essential for the monitoring of the Abumatariq project, for example, helping me to communicate with the implementing partner on the progress of the project. The people I met didn’t call themselves volunteers, but this is exactly what they were, as they actively helped each other. I am proud that my work raised awareness among many people that they could use their voluntary effort to advance their own development. When I visited Buram Hospital in Sector South, I met the Medical Officer who informed us that there were no special facilities for examining expecting mothers. This really affected me. And I decided to share what I understood with my supervisor, who agreed that she was going to support me on the initiation of a dedicated centre at the hospital. When I approached the Ministry of Health with the idea, they welcomed it and even asked for other similar projects. Therefore I initiated, with UNAMID, the renovation of several areas of different hospitals, among them Nyala hospital, Elwado medical centre, and Buramu Hospital. When I was redeployed to Sector East, I also initiated five projects, two at Eldaein Hospital, two at Abumatariq hospital, and one at a Girls' School block, a latrines block and an office. Using my interpersonal communication skills, I managed to initiate and supervise more than ten projects. So I look back and realize that at least I have left a foot print that will go a long way in assisting not only expecting mothers, but the entire community. And I have learned to respect and value other people, no matter who they are.